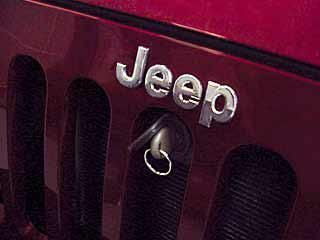 Protect what's under your hood with a Mopar Jeep Wrangler hood lock from JustforJeeps.com. This sturdy, secure hood lock rivets into existing holes for easy installation. The lock cylinder will need to be coded by a Jeep dealer or locksmith so the lock cylinder will be keyed to your ignition key. This is the same model as the production Jeep JK Wrangler hood lock made for European markets. This Mopar hood lock meets Thatcham requirements. Hood Lock needs to be coded by Jeep dealer or locksmith to ignition key before installation. A necessity - especially in urban areas. Piece of mind is priceless. ProsIs exactly as pictured. Provides needed security. ConsHaving the dealership key this is pricey (especially for how little work they actually had to do), but that could just be the dealership or because the labor rates of the area. Kudos to customer who thought of a locksmith - didn't even thinks of that. The Mopar hood lock is great! I dropped everything off with my locksmith for a one-day turnaround. He charged me $25. I ordered a T-Rex billet grille for a complete install. Keep in mind you will have to assemble the lock prior to installation... 4 rivets to be exact. If you've never used a rivet gun before, drill a hole between 2 surfaces and practice. You'll get a feel for it. I messed up the first rivet and I spent nearly 40 minutes drilling out the rivet. Lesson learned. Once it is all riveted together, you'll use 4 more rivets to fasten the lock to the frame. As I continue my upgrades, I'll eventually upgrade the security system. This will be peace of mind for now. Easy install process. RIVET SIZE: 1/4" (the included parts lost does not say). The security provided allows for less worry when leaving it in a parking lot/area you aren't familiar with. This is a wise purchase to make. ConsIncluded parts list/instruction sheet is not very informative. You will need a rivet gun that accepts 1/4" rivets. You will have to buy riveter to install this! Install is easy after that. Took me 30 minutes including the grill removal and reinstall. I went to a local locksmith and had them cut me a extra key (without the chip) so in that I could open the hood while the engine is running. The rubber seal around the key hole is a little weird to get used to. Living in NYC and adding LED headlights to my JK, this was a no-brainer for me to buy, simply for the piece of mind. It was easy to install; just make sure you have a rivet gun that can support up to 1/4" rivets, as the rivets supplied with this are 7/32". Once you have the grill off, it attaches in minutes.